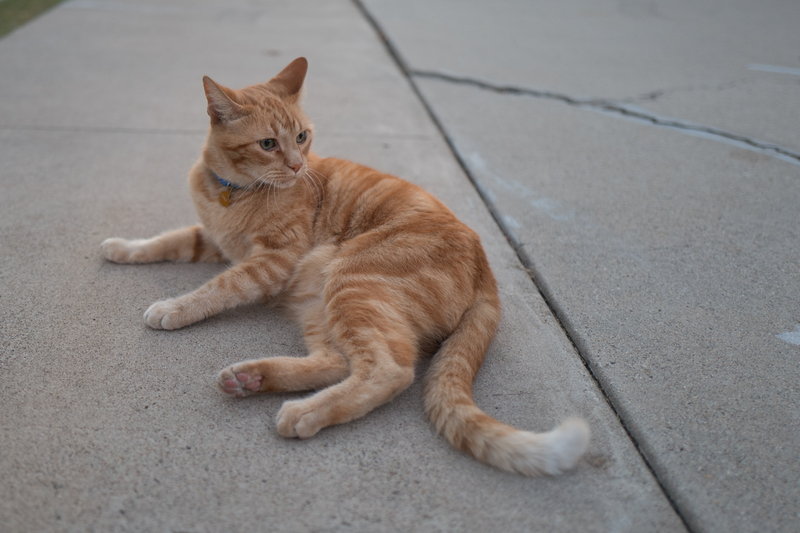 On Sept. 27, 2017, for the second evening in a row, I observed a lean, orange furball in a yard on Campus Ave. between Meade and Monroe. Our first meeting was at 7:04 p.m. PDT—or nearly 30 minutes after sunset—when iPhone 7 Plus proved ineffective producing anything less than photos so overly-noisy that they could stand-in for bad impressionist painting knock-offs. Eh, no, to your question about there being some cool, new iOS 11 camera filter at work. Oh I wish! The next sighting was earlier, 6:51 p.m. PDT for the Featured Image, but captured with the esteemed Leica Q about 14 minutes after sunset. Once again, the 28mm f/1.7 Summilux lens and 24-megapixel full-frame sensor delivered magnificently. 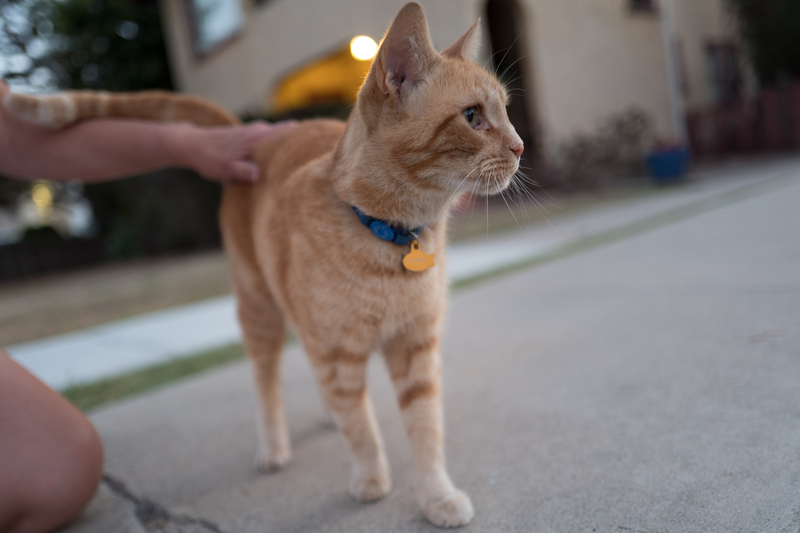 This first pic is all about bokeh and narrow depth of field that draws the eye to the kitty’s face and head, which detail is super sharp. Vitals, aperture manually set: f/1.7, ISO 500, 1/60 sec, 28mm. That’s my wife petting him, BTW. Her new-found friend is the second Charlie to appear in the series (so says his collar tag). We met the first Charlie on Aug. 17, 2017; he is new pet to the previous owners of The Colonel, who was stricken by cancer. 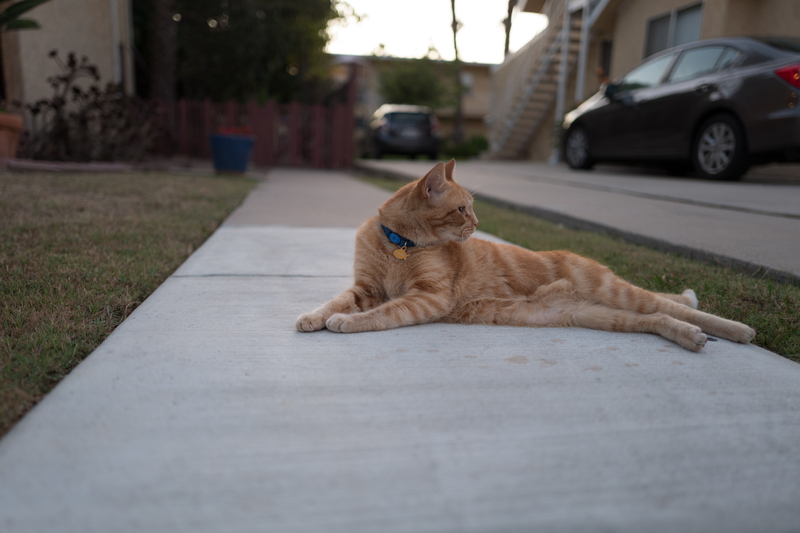 Anne wonders if there is some kinship between this lanky orange cat and Watson, who lives several blocks away. Coincidentally, we visited him one afternoon earlier this week. I am nearly certain that second Charlie is companion to the chubby siamese nicknamed Dusk, dubbed so because of the evening time of our first meeting four months earlier. Three nights ago, the two cats were in the same yard, and she sat almost exactly in the same spot as she did in May. She keeps her distance, unlike her yard buddy/housemate. The second photo, like the first and third, is cropped for composition. Vitals are same, except for ISO 400 and 6:52 p.m. PDT timestamp. Pic three’s vitals are the same as one’s, but time is a minute later than two. The latter portraits demand you to click and open them, then expand to full size. Details are sharp! If the Q in the Leica’s name isn’t meant for quality, it should be. Blasts from the past: Scruffy, Roly Poly, Woo, Skull, Biscuit, The Colonel, White, Chipper, Frisky, Stretch, Needy, Farfisa, Mates, Hunter, Pee-Pee, Blue, Blue Too, Bonded Pair, Patience, Fess, Jumper, Frenemy, Looker, Cozy, Scout, Lurks, Skit, Mini, Betty, Black and White, Stalker, Bell, Chill, Sammy, Scratch, Poser, Star, Grey and White, Watcher, Herman, Comet, Roman, Willow, Chub, Nimbus, Watson, Lilo, Kit, Pepe, Twilight, Sebastian, Spot, Booger, Ash, Veruca, Riley, Mellow, Bonde, Flower, Glass, Black, BeBe, Fang, Bruce, Siamese, Pounce, Tortie, Haiku, Fraidy, Peso, Daniel Tiger, Dusk, Stride, Dainty, Spry, Tabby, Betty Too, Still, Levi, Shadow, Sophie, Wink, Ferals, Momma, Charlie, Tux, Cool, Benny, Jellicle, Itchy Valentino, Goldie, Nine, Amanda, Siesta, and ChaCho.